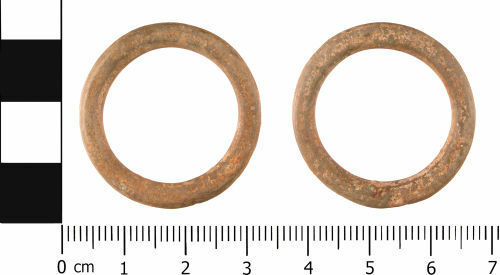 A complete copper alloy ring or loop which functioned as a curtain fitting, of Post Medieval dating (15th to 17th Centuries AD). It is sub-circular in shape with a circular cross section with rounded edges. In profile the loop is flat. Filemarks are present on both the front and back surfaces. It measures 30.6 mm external diameter, 22.6 mm internal diameter and 3.9 mm thick. The ring is 4.1 mm wide. It weighs 9.4 grams. The curtain fitting is a dark green colour, with an even surface patina. Similar rings are illustrated in Margeson (1993, p. 82, Fig 47, #522-524). Margeson describes them as being suspension rings which were probably multi-functional, including curtain rings. The three excavated from Norwich (No. 522-524) date from the mid 15th to mid 17th century. Egan (pers comm) suggested they date from the 14th to 18th century and there is evidence they were used as curtain rings. Margeson, S. 1993 Norwich Households: The Medieval and Post-Medieval Finds from Norwich Survey Excavations 1971-1978. East Anglian Archaeology Report No. 58 / Norwich Survey.